It’s a proven fact that people over eat at the weekend in comparison to their weekly routine. 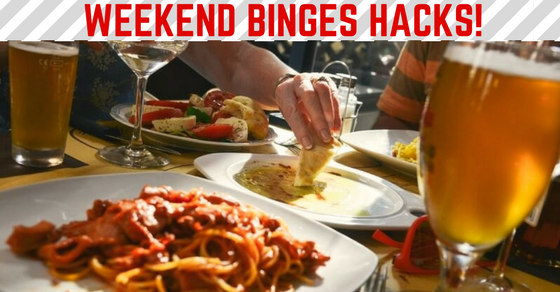 After all it’s a time of relaxation, fun and socialising, however so many people suffer from stagnant results or even backwards steps following weekend binges. Do you spend large parts of your weekend feeling like your in a food comma, drunk or simply horizontal? We are firm believers in balance, and setting realistic targets, it’s key when striving for goals. We hear of your frustrations time and time again, which is why we wanted to provide you with three simple hacks to avoid this cycle. Prepare healthy food for the weekend, many people will plan, prepare and execute a clean diet Monday through to Friday, and totally leave the weekend to chance. This is recommended as it only takes a few moments of madness or a lack of willpower. Have healthy food around you, for 80% ready for your 80-20 rule. Even better, save time and money by ordering meal prep delivered t your door here. This way you have food stocked up allowing you deviate if you wish at particular moments throughout the weekend. Make it fun, If you don’t wish to eat the same foods all week, why not eat healthily however adding variation. Have healthy meals that you wouldn’t normally eat, with the reassurance they are still fresh whole-foods that will have no negative effects to your goals. It’s also key to surround yourself with the correct food, make sure you have food with you at all times. Store it in you meal bag, avoiding temptations and poor decisions! We see the majority do the right things all week, yet seem surprised when weekends go a little wonky… it’s simply that the same action isn’t being carried out. Therefore order that meal prep, or spend Friday night in the kitchen allowing you to stay on track with the 80-20 rule this weekend. This will allow you to enjoy the weekend ahead without feeling like a bloated and like you have eaten for England on Monday morning. Quite simply we all hate that feeling right. 9(the, why did we do that moment). We hope this has helped, we advise you take take action and commit to the above steps. For further information on our meal prep service simply click here. Fridays delivery awaits many of you, please share if you feel that this article would benefit anybody that you know.